Having one of those early mornings where you just feel ready and rested seems like an achievable dream for many. If it’s not because it’s impossible to get the number of hours you need each night, it’s because the bed is simply too comfortable in the morning - and we’re not going to swap our beds out for something less comfortable either. Yet, there are ways to get that recharged and blissful feeling each and every morning without giving up on your late-night Netflix binge. While it would be better if you did give up on it, you don’t have to as long as you’re able to implement some other routines. Here are a handful of great tips to waking up rejuvenated and ready to start the day. Your inner child is craving structure and a good routine, so it’s a smart idea to begin some new bedtime habits. It can be tough to parent ourselves, but when you get used to a new night time routine, it will hardly feel like parenting at all. Eat A Light Meal. Hopefully, you are already subscribed to the Five Meal Plan for Health and are eating 5 small meals a day. Eating this way helps to keep your appetite under control while managing your blood sugar levels. This will also help in overeating at night. For dinner, especially on weeknights, consider lighter meals that include roughage, protein and grains. Drink a solid 8-16 ounces of water, too. Save the wine (and other libations) for the weekend. Don't Eat Too Late. Falling asleep on a full stomach can bring a host of discomforts, including acid reflux, indigestion and heartburn. Try not to eat at least two full hours before bedtime. If you do suffer from any of these issues and are taking medication for them, be sure to stick to your dosage and take your meds at the same time each day. Get Ready For Tomorrow. Getting in the habit of preparing for the next day the night before will help alleviate several a.m. stressors. Prepare your lunch, lay out your clothes and check your planner or agenda. Make sure you know where your purse, keys and phone are. The more prepared you are for the next day, the less you'll have on your mind at night. Do Some Stretching Or Light Yoga. Even if you are a total yoga novice, there are many benefits to doing a bit of stretching or downward dog in the evening. It helps to relax your muscles and releases tension, increases blood flow and circulation and even engages the "parasympathetic nervous system", which is responsible for “rest and digest” functions. (the opposite of "fight or flight", which how we spend most of our days). Take A Warm Bath. A big part of self care involves creating positive, relaxing rituals for ourselves. One of these rituals should be a warm, relaxing bath a few times a week, for no other reason than decompressing and de-stressing. Draw a warm bath and add your favorite essential oils, something comforting like lavender or chamomile. While you soak, take in a few chapters of a book, skim through a magazine or catch up on social media. It's your time to unwind. Sip Some Relaxing Tea. Purchase a quality brand of loose tea with relaxing benefits. I suggest loose tea because it's more a concentrated, higher grade tea than it's bagged cousin. Chamomile tea is the gold standard when it comes to promoting rest and relaxation, but there are many blends available now that you might also enjoy. Steep loose tea in a tea ball, sip and relax. Set A Regular Bedtime. Adults are creatures of habit and routine, and having a regular bedtime is an integral part of our body's routine. Having a regular sleep schedule, including our bedtime, ensures we wake up well rested and refreshed. 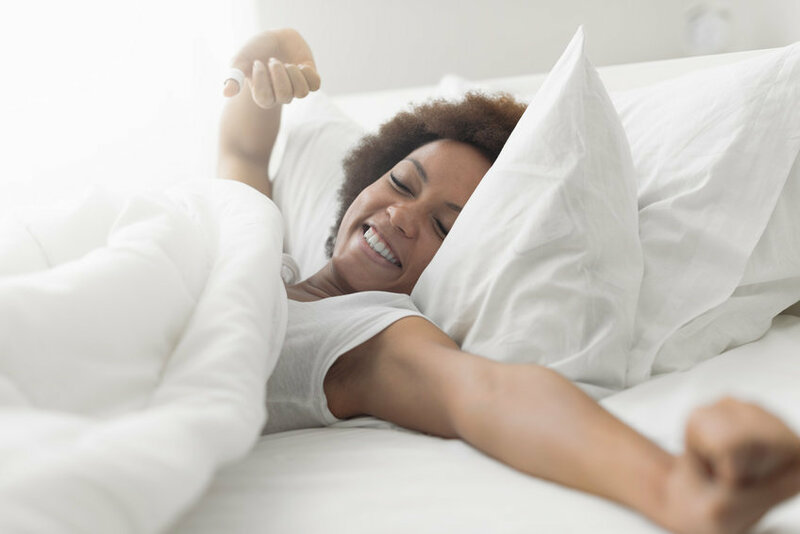 Aim for about 8 hours of sleep--your body may need more or less--but once you get into a sleep routine you'll know just what your body requires. And as tempting as it is, try not to deviate too much from your normal bedtime on weekends, either. Sometimes we think we can stay up a little later because we can sleep in a little later, but this is detrimental when trying to create a regular a bedtime routine. When you spend so many hours in one room (even if you are unconscious--lolz), it’s a good idea to consider how that room is affecting your mood and attitude. Your Bed. Make sure that you have a decent bedroom set with a comfortable mattress and supportive pillows. A mattress with an adjustable base can improve circulation by adjusting the height of various parts of your body. With better blood flow through the night, you’ll notice a reduction in aches and pains in the morning. ​Color Scheme. Colors can actually have a huge impact on our state of mind, and you’d want to use calming colors that will help you relax. According to Bob Vila, white, pale blue, sage green and gray are some of the colors that help to promote a sense of calm. Room Temperature. Another point to consider is your bedroom's temperature. Bedroom temperature should be between 60 to 68 degrees for optimal sleep. Sleeping with your fan on or a window slightly open (in cooler months) will help tremendously. If you notice your room is too dry, an inexpensive humidifier can help add moisture back into your room. Noise. Depending on where you live, or how sensitive of a sleeper you are, noise can be extremely detrimental to getting a good night's sleep. Consider purchasing a white noise machine, which will help to drown out the sound of traffic, construction and other unpleasant noises. Alternatively, if you enjoy a bit of sound while drifting off, look for a sound machine that offers sounds of nature, like rain, wind, ocean and birds. We hope you found this information helpful and hope we've provided some tips that you can incorporate into your own bedtime routine. If there are any others you use, let us know in the comments below, we'd love to hear about them!